i apologize but i'm having difficulty finding spare time these days. if i'm not working, i'm traveling to seoul to be with family, or doing laundry or cleaning my apt in preparation to travel to seoul. if none of the above, i'm studying korean or trying to squeeze in a few hours of sleep before running again. my life has been turned upside down a bit over the past month or so and i'm still trying to find the right balance. the past couple of weeks have been really great. since i first met with my birth family, i have traveled to seoul every weekend to stay at the house and visit. the 2 hour one-way trip, though, has been really exhausting and i can't keep up the every week thing anymore. i'll still visit a couple of times a month. little brother hyun-bae was in korea until last night, when he flew back to his university in china. we had a great time together and bonded quickly. he's the sweetest kid you've ever met and smart as a whip. i'll go ahead and take this opportunity to brag about how he speaks korean, chinese, english, & sign language...and is currently studying japanese in his free time. unbelievable. he got the brains in the family, i guess. we had a great time shopping and eating and visiting extended family together. i have to admit that i really adore both of my brothers. it was tough to see hyun-bae go, but that's what skype is for, right? hopefully we will be able to spend a few more days together in january after he finishes his semester and before i head back to the states. omma & appa and the rest of the family are still spoiling me to death. if i stayed in korea, i'd weigh about 3,000 pounds and be the best-dressed kid around. it's tough, though, needing a translator constantly. it's a little funny to my off-kilter sense of humor, but infinitely frustrating for them. they desperately want to speak to me easily without needing one of my poor brothers around. so i need to learn fast. please pray for me. if i could pay a million dollars to wake up and be fluent in korean, i would. unfortunately it doesn't work that way and i need the time and mindset and energy to put in hours and hours of study time every week. also unfortunately, these days i don't have much extra time and by the time i sit down with a korean book at the end of the day, i last all of 5 minutes before i'm passed out and drooling all over the pages. my proficiency in the language will be crucial to building a healthy foundation for our relationship and is, therefore, absolutely essential. these days are really stressful as the end of my work contract draws quickly nigh. my korean family wants me to stay as long as i can and my american family wants me back in the states. my boss is yelling at me to buy my crazy expensive plane ticket for reimbursement and immigration wants me to jump through crazy hoops in order to stay legal and abide by the established visa rules. not to mention the fact that i have no job lined up once i get back to the states, and have no idea even which state i'll be living in. i'm being pulled in about a thousand different directions right now and it's starting to wear on me. obviously i brought this upon myself and knew the can of worms i was opening when i visited the adoption agency last month, but nevertheless, it's overwhelming. keep me in your thoughts, will you? it's amazing to me how quickly my korean family and i are getting to know each other and learning our similarities and differences. as you might imagine, we have a LOT of differences, considering the fact that i grew up in american culture for the past 23 years and none of them have ever stepped foot on american soil. but we also have so many similarities, it's not even funny. i mentioned it before - but i see so much of myself in each family member...there is no doubt that we are blood-related. i was eating breakfast with omma & appa on saturday morning and they started laughing at me. i was so confused but then they pointed to my legs and said "seong-bae! seong-bae!" i have this terrible habit of bouncing my legs whenever i'm sitting in a chair. i do it totally unconsciously but it drives everyone around me absolutely nuts. and sometimes it gets really out of control. if we've ever had coffee together, i apologize if i bounced your mocha or scone right off the dumb table. i've never known why i bounce my legs, but i know it's an obnoxious problem. and apparently, my older brother does the same obnoxious thing. omma yells at him to stop, but he just can't. aye aye aye. we are the same. also, it would appear as if mega surprises are nothing new to my korean family. hahaha. 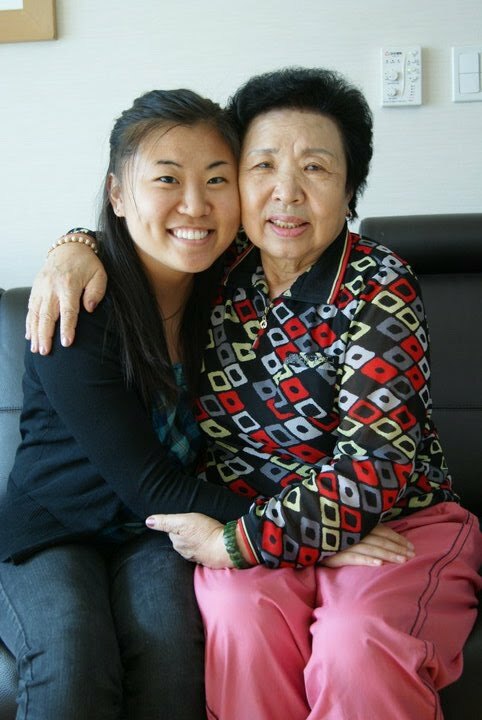 my brother explained to me that my grandfather was a north korean who defected, came to south korea, and married my grandmother. about 7 years ago, some of his family from north korea somehow found my family and there was a big, tearful reunion. compared to that, my situation is no big deal! hahahaha. a few shots from the past couple of weeks to close out this post. meeting my paternal grandmother for the first time. she's as sweet as she looks. 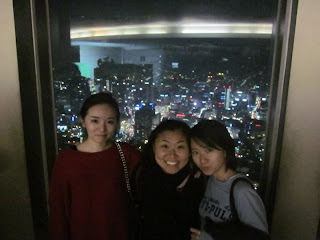 my aunt & cousins took me to seoul tower. it was awesome and they're amazing. my cousins also speak pretty good english. appa, hyun-ah, omma. big brother seong-bae. omma. i'm off to study and sleep. everyone be well & i'll be back with more pictures sometime within the next few weeks!